One of the hottest vehicles on the market may be perfect for your child. Does your child have it all? Well, maybe you can buy him or her a Tesla. 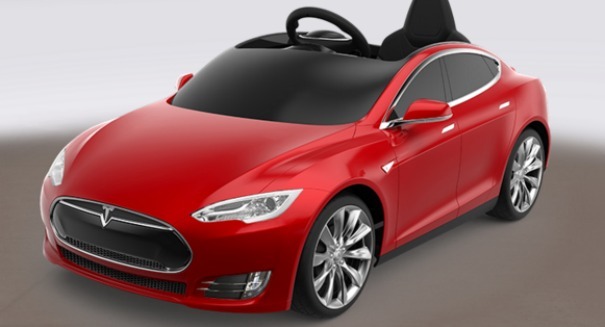 Radio Flyer has announced that they’ll be making a battery-powered ride-on toy that resembles a Tesla Model S, and it’s available for preorder for $499 — certainly a good bit cheaper than a regular size model, according to a SlashGear report. The sleek toy certainly looks the part, with working features like a headlight, and even a space under the hood it calls a “frunk” in which you can put small objects. The car has a steering wheel and a single seat, as well as a single pedal for acceleration. It even has forward and reverse gears, and a sound system that you can connect an MP3 player to. And in case that isn’t enough, it’s customizable as well. You can swap out the battery for a more powerful one that gives you 50 percent more play time. You can also choose a color: red, deep blue metallic, or midnight silver metallic. The wheels can be changed, spare batteries are available, and an indoor car cover will keep it from getting dirty. The toy will ship in March 2016. If you take all the options, it will cost you $804 — $305 over the base price. Radio Flyer is of course best known for its product line of little red wagons, tricycles, and other toys for kids, but its push into the miniature car market is serious as it recognizes a toy market that is rapidly evolving toward electronic toys. The company was founded in 1917, and its first product was their famous wooden toy waagons, which it sold to area shops in Chicago.